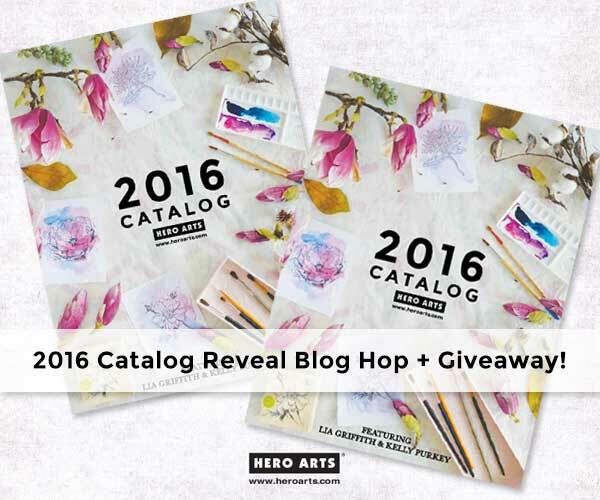 Hello everyone and thank you so much for stopping by today as we celebrate the launch of Hero Arts Spring 2016 catalog. You will begin finding our new Hero Arts products at your favorite store soon! And all products will be available in the Hero Arts store beginning February 8. Included in this release are 31 new clear sets including 5 additions to our popular Color Layering line, 29 new woodblock stamps, 11 new woodblock sets, exciting new dies, 3 new ombre ink pads in neon colors, and a whole new line of brightly colored hybrid inks! 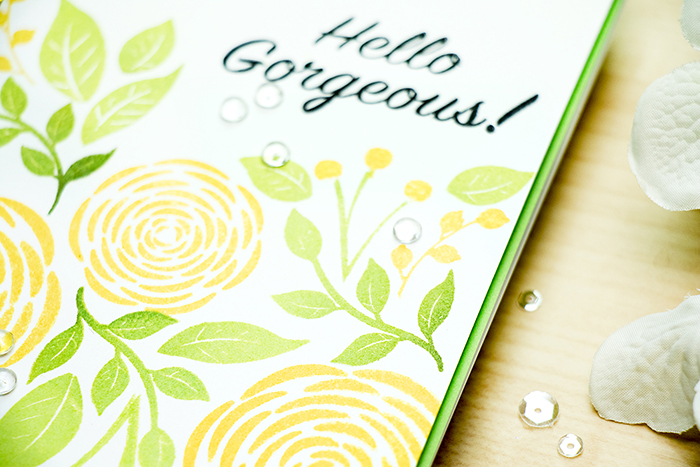 I created a simple stamped Hello Gorgeous card using blooms from the You’re So Lovely clear stamp set and sentiment from the Hello Gorgeous clear stamp set. 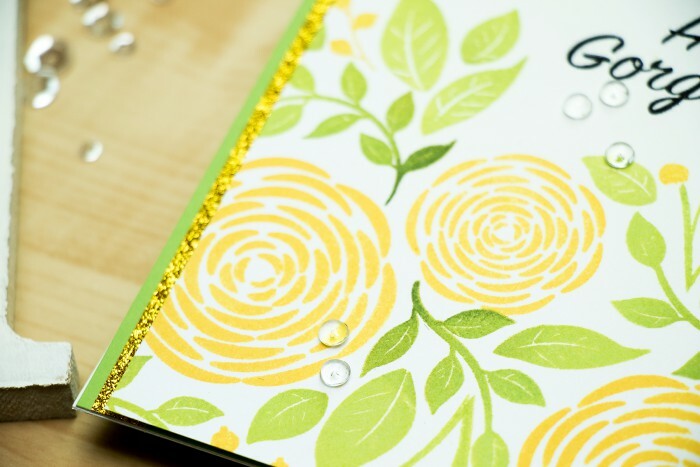 I used one of my favorite color combos – yellow and green and also added a hint of gold glitter. I used beautiful Butter Bar Yellow ink to stamp the flowers and Lime to Green Ombre to stamp the leaves. I also scattered a few small clear droplets to create the look of rain drops on my project. New catalog is packed with new fabulous products! Lots of fun new Color Layering, a couple awesome new ombre inks and so many other wonderful sets to chose from. I’ll be sharing lots more cards using these goodies soon so stay tuned! We are giving a grand prize away to one lucky reader, drawn from comments left across all blogs in the hop. The prize consists of a selection of new products from this release! Comment by 11:59 pst on Sunday, January 17, and we’ll anounce the winner the following week. Hop along and comment for more chances to win! I’m in love with your gorgeous card!! Love the use of the ombre green stamp. Gorgeous card!! I like the colors you used and, of course, the stamps!! I learn so much from you. Love how you make things so beautiful. Beautiful card! I love the citrus color combination. That yellow really catches my eye! Love this bright & cheery card! Awesome things to put on my wish list! I love this new floral stamp. Oooh……gorgeous card!! The color combo is perfect. The clear droplets give this project such an elegant finishing touch. Beautiful! Love the fresh look of the card. What beautiful flowers! And your colour combo is so cheery! I also love the touch of gold! 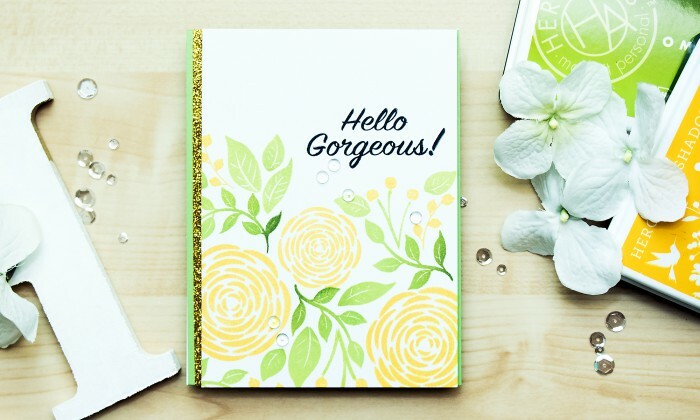 This is such a beautiful card; it makes me think of spring right away! I love the use to the ombre ink for the leaves, clever! beautiful card!! I love the flowers !! Your card is stunning! The new ink colors make me happy! Beautiful card and such inspiration! Love that yellow and how it reminds me of spring. Very beautiful and spring card! HA never disappoints with their designs. What a bright and cheery card!!! I am going to remember the color combo. Thank you! Love the new hero art stamps–your cards are lovely!